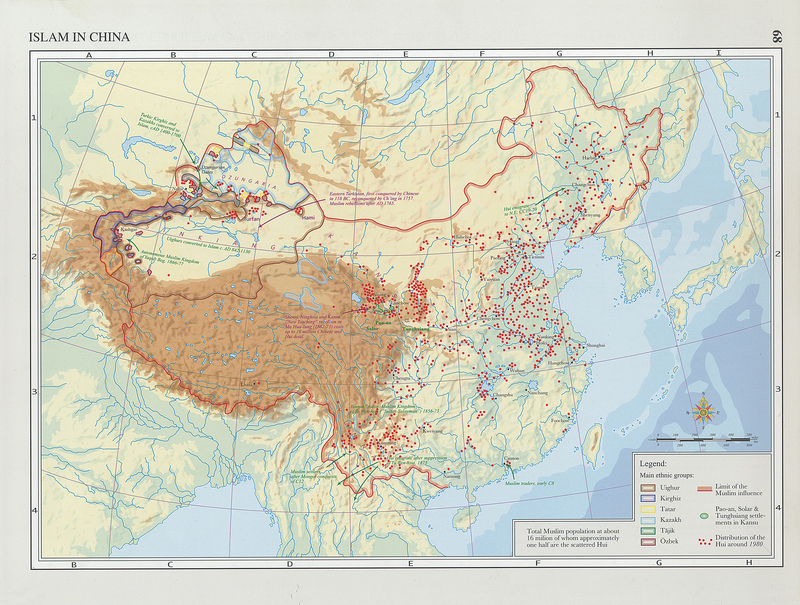 Islam in China [map]. 1: 20,000,000. In Hugh Kennedy (ed. ), An Historical Atlas of Islam. (2nd, revised ed.) Leiden: Brill, 2002 (p. 68). Islam entered China by two main routes: from the southeast, following the well-established maritime communication lines to Canton; and from the northwest, passing over the Pamirs and through the Tarim Basin to Kansu and Shensi, following the ancient Silk Road. Many of these Muslim merchants, soldiers and freebooters settled down and married Chinese wives, giving rise to today’s Hui (Chinese-speaking) Muslim. China also has a small Iranian community of Tajiks in the far west, and a group of Muslims with Mongol blood, the Tung-hsiang, in Kansu. All Chinese Muslims are Sunnī Ḥanafī, except the Tajiks, who are Nizārī Ismaʿīlī, or followers of the Aga Khan. The number of Chinese Muslims is projected to increase from 23.3 million in 2010 to nearly 30 million in 2030. Only three other countries where Muslims are the minority – India, Nigeria and Ethiopia – have more than 20 million Muslims. Data Source: The Future of the Global Muslim Population. The Pew Research Center. (Polling and Analysis. January 27, 2011). For 250 years, the Turkic Muslims of Altishahr--the vast desert region to the northwest of Tibet--have led an uneasy existence under Chinese rule. Today they call themselves Uyghurs, and they have cultivated a sense of history and identity that challenges Beijing's official national narrative. Rian Thum argues that the roots of this history run deeper than recent conflicts, to a time when manuscripts and pilgrimage dominated understandings of the past. Beyond broadening our knowledge of tensions between the Uyghurs and the Chinese government, this meditation on the very concept of history probes the limits of human interaction with the past. Uyghur historical practice emerged from the circulation of books and people during the Qing Dynasty, when crowds of pilgrims listened to history readings at the tombs of Islamic saints. Over time, amid long journeys and moving rituals, at oasis markets and desert shrines, ordinary readers adapted community-authored manuscripts to their own needs. In the process they created a window into a forgotten Islam, shaped by the veneration of local saints. Partly insulated from the rest of the Islamic world, the Uyghurs constructed a local history that is at once unique and assimilates elements of Semitic, Iranic, Turkic, and Indic traditions--the cultural imports of Silk Road travelers. Through both ethnographic and historical analysis, The Sacred Routes of Uyghur History offers a new understanding of Uyghur historical practices, detailing the remarkable means by which this people reckons with its past and confronts its nationalist aspirations in the present day. This second edition of Dru Gladney's critically acclaimed study of the Muslim population in China includes a new preface by the author, as well as a valuable addendum to the bibliography, already hailed as one of the most extensive listing of modern sources on the Sino-Muslims. Are they really Muslims? Islam in China reveals the struggle for identity of the small yet vital Muslim community of China, a little studied minority on the fringes of the Islamic world now thrust into the spotlight by the opening of China to the world and the rise of independent Muslim republics on China's western borders. The Chinese-speaking Muslims have for centuries been an inseperable but anomalous part of Chinese society--Sinophone yet incomprehensible, local yet outsiders, normal but different. Long regarded by the Chinese government as prone to violence, they have challenged fundamental Chinese conceptiosn of Self and Other and denied the totally transforming power of Chinese civilization by tenaciously maintaining connectios with Central and West Asia as well as some cultural differences from their non-Muslim neighbors. Familiar Strangers narrates a history of the Muslims of northwest China, at the intersection of the frontiers of the Mongolian-Manchu, Tibetan, Turkic, and Chinese cultural regions. Based on primary and secondary sources in a variety of languages, Familiar Strangers examines the nature of ethnicity and periphery, the role of religion and ethnicity in personal and collective decisions in violent times, and the complexity of belonging to two cultures at once. Concerning itself with a frontier very distant from the core areas of Chinese culture and very strange to most Chinese, it explores the influence of language, religion, and place on Sino-Muslim identity. The global spread of Islamic movements and the ascendance of a Chinese state that limits religious freedom have aroused anxieties about integrating Islam and protecting religious freedom around the world. Focusing on violent movements like the so-called Islamic State and Uygur separatists in China's Xinjiang Province threatens to drown out the alternatives presented by apolitical and inwardly focused manifestations of transnational Islamic revival popular among groups like the Hui, China's largest Muslim minority. This book explores how Muslim revivalists in China's Qinghai Province employ individual agency to reconcile transnational notions of religious orthodoxy with the materialist rationalism of atheist China. Based on a year immersed in one of China's most concentrated and conservative urban Muslim communities in Xining, the book puts individuals' struggles to navigate theological controversies in the contexts of global Islamic revival and Chinese modernization. By doing so, it reveals how attempts to revive the original essence of Islam can empower individuals to form peaceful and productive articulations with secular societies, and further suggests means of combatting radicalization and encouraging interfaith dialogue. As the first major research monograph on Islamic revival in modern China, this book will be of interest to students and scholars of Anthropology, Islamic Studies, and Chinese Studies. This book brings together the most important articles of the late Joseph F. Fletcher (1934-84), a scholar widely acclaimed for the breadth and brilliance of his historical thought and for his almost unequalled linguistic competence. Fletcher#65533;s mastery of the major languages and historical traditions of East Asia, the Middle East and Europe gave him a unique ability to trace historical movements across the cultural boundaries of Eurasia. The articles in this collection summarize his researches on the relation of China to its neighbours, the history of nomad society, and the interconnections among the great empires of the early modern age. Fletcher#65533;s highly important research into the Islamic revival movements of China and Inner Asia is collected here for the first time, including his most complete, but previously unpublished study of the subject, The Naqshbandiyya in Northwest China#65533;. Between Mecca and Beijing examines how a community of urban Chinese Muslims uses consumption to position its members more favorably within the Chinese government's official paradigm for development. Residents of the old Muslim district in the ancient Chinese capital of Xi'an belong to an official minority (the Hui nationality) that has been classified by the state as "backward" in comparison to China's majority (Han) population. Though these Hui urbanites, like the vast majority of Chinese citizens, accept the assumptions about social evolution upon which such labels are based, they actively reject the official characterization of themselves as less civilized and modern than the Han majority.By selectively consuming goods and adopting fashions they regard as modern and non-Chinese--which include commodities and styles from both the West and the Muslim world--these Chinese Muslims seek to demonstrate that they are capable of modernizing without the guidance or assistance of the state. In so doing, they challenge one of the fundamental roles the Chinese Communist government has claimed for itself, that of guide and purveyor of modernity. Through a detailed study of the daily life--eating habits, dress styles, housing, marriage and death rituals, religious practices, education, family organization--of the Hui inhabitants of Xi'an, the author explores the effects of a state-sponsored ideology of progress on an urban Chinese Muslim neighborhood. 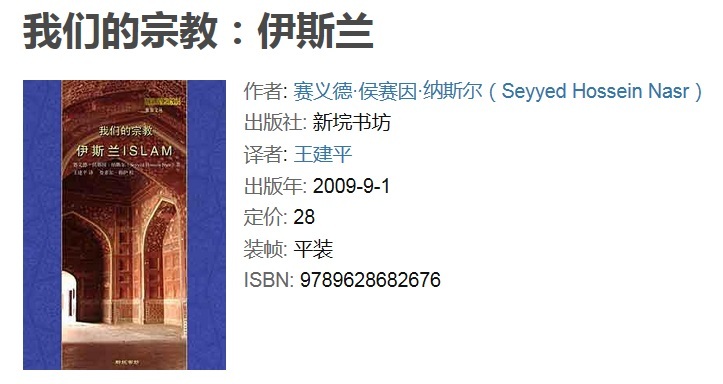 The First Islamic Classic in Chinese : Wang Daiyu's Real Commentary on the True Teaching [ Zheng jiao zhen quan] translated with an introduction and notes by Sachiko Murata. A translation of Wang Daiyu's Real Commentary on the True Teaching, the first and most influential work written in the Chinese language on Islam. Published in 1642, Wang Daiyus Real Commentary on the True Teaching' was the first significant presentation of Islam in the Chinese language by a Muslim scholar. It set the standard for the expression of Islamic theology, Sufism, and ethics in Chinese, and became the literary foundation of a school of thought that has been called Muslim Confucianism. In contrast to Muslim scholars writing in every other language, Wang avoided Arabic words, opting instead to reconfigure the religion in terms of Chinese concepts and categories. Employing the terminology of Neo-Confucian philosophy, his overview of Islam is thus both congenial to the mainstream Islamic tradition and reaffirms Confucian teachings about the human duty to establish harmony between heaven and earth. This book will appeal to those curious about the manner in which Islam has flourished in China over the past thousand years, as well as those interested in dialogue among religions and the significance of religious diversity. Annotated Turki Manuscripts from the Jarring Collection Online Chaghatay 2.0 Web site hosts information about late Chaghatay (a variety of Middle Turkic spoken in Central Asia) and its descendants, especially those varieties spoken east of the Pamirs: early modern Uyghur (Turki) and modern Uyghur. The information here stems largely from projects directed by Prof. Arienne M. Dwyer of the University of Kansas and C.M. Sperberg-McQueen of Black Mesa Technologies.